HostIran Review 2019: Is HostIran a Good Hosting? HostIran is one of the top web hosting providers in their home country. Most of their customer base comprises businesses and individuals in Iran. HostIran provides web hosting and a range of solutions including web design and development, SMS, backup storage, and domain registration services. They’re one of the top hosting companies in Iran with their own dedicated data center. Unfortunately, while they’re one of the few Iranian web hosts that owns and operates their own data center and can therefore offer better services and reliability than most other Iranian providers, their packages are rather lean on features. For instance, while they do support PHP and MySQL, they don’t appear to support more advanced scripting languages such as Ruby on Rails and Python. Also, none of their packages include free SSL certificates, one-click app installers, or a website builder — and it’s unclear whether or not they offer any backups beyond the manual backup system you can access via cPanel. On top of that, most of their packages come with extremely limited storage and bandwidth, and they don’t include a free domain registration with their packages. On the upside, HostIran offers green dedicated servers for personal or business use, so if environmental impact is something that you’re concerned about, consider this a plus on your checklist. With an extensive range of packages priced in Iranian Rial, HostIran gives you multiple options that might fit whatever budget you have. They don’t charge setup fees, though their packages include a 9% VAT charge. That said, while their packages are reasonably priced, given their overall lack of features and functionality, I’d consider HostIran rather poor value for money. There are many things you’ll have to purchase separately on top of your hosting package to build a decent online presence, such as a top-level domain and SSL certificates. Support is in Persian only as most of their customer base is Iranian. This isn’t available 24/7, but they’ve got extended office hours: you can reach their technical support team via support tickets or telephone every day from 9am to midnight. If you’ve got sales-related questions, you can also access their live chat during those hours to talk with one of their operators. Overall, I found their support average given their limited support channels, but I did appreciate that they’re available every day rather than just weekdays. HostIran is one of the few providers with their own data center in Iran, so if it’s imperative that your websites are hosted on Iranian servers, then they’re a decent choice. However, you can find much better features and value for money with other international providers. 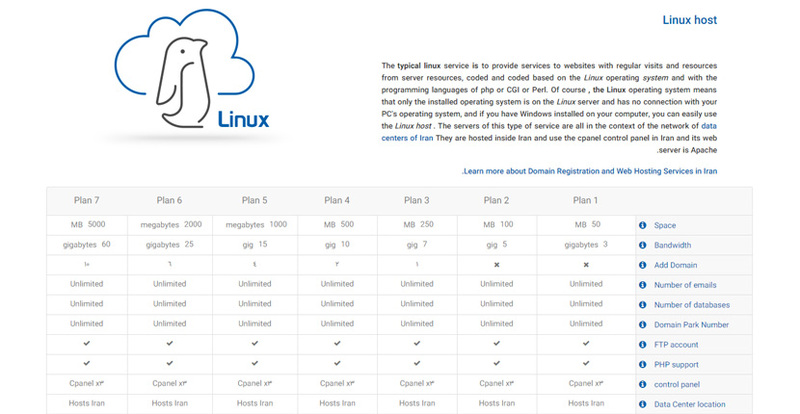 Wondering how HostIran stacks up against other Web Hosting companies? Enter any other Web Hosting company and we will give you a side-by-side comparison.